It took us 2 days to clean up the boat after the passage from Tahiti: dry all the towels, shop vac the bilges, and finally relax. On the third day we went to the village in Hao. Within an hour a funny fellow named Ipu adopted us, and spent the morning walking us around. He is constantly joking and laughing. With medical training in the French army, Ipu had visited all the remote atolls as a traveling doctor. Now he was enjoying his retirement with good cheer, welcoming visitors to his atoll. In the past, Ipu had worked on the army base in Hao. The base closed down (for the most part) ten years ago. Hao was an important military site for forty years. It was the headquarters for the infamous nuclear testing that France conducted in the remote atolls of Mururoa and Fangataufa, 250nm to the south. The nuclear testing ended in the 1990s. Ipu said he loves welcoming sailing yachts to Hao. 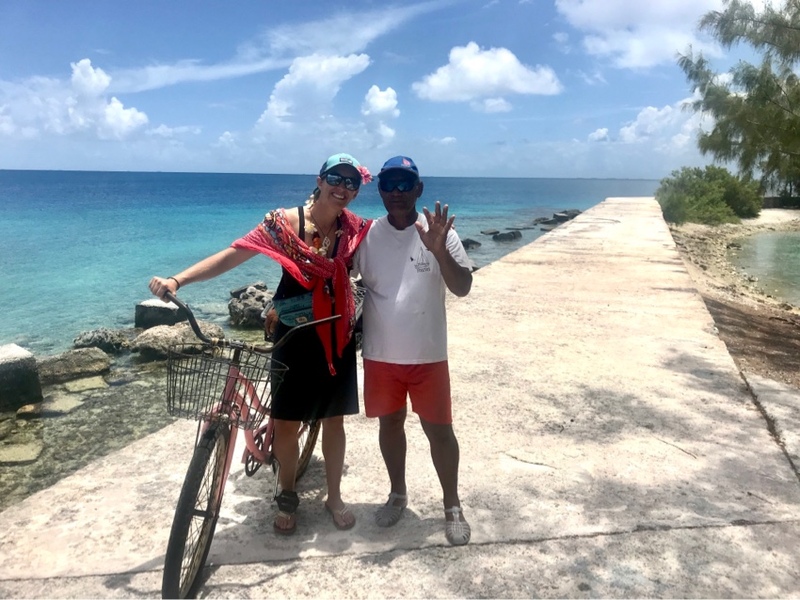 He insisted on lending Sabrina his bicycle as we hunted for internet and visited the gendarme to check in (port captain/police). And what about laundry? “Bien sûr!” Ipu agreed, “Come to my house tomorrow and you can do all your laundry — and you can do my laundry too!” He laughed heartily. ALL our laundry?! Do you have any idea what you’re offering, Ipu?? It was a warm welcome to Hao. Yay for a beautiful new friend, Ipu! A man who knows Haro to make you two happy! But… hey! It’s fabulous you guys are living it !!! Keep them coming … they make my day! Nice to have such a welcome. You must be loving the warm dryness and especially the clean clothes. You are blessed to have met Ipu.